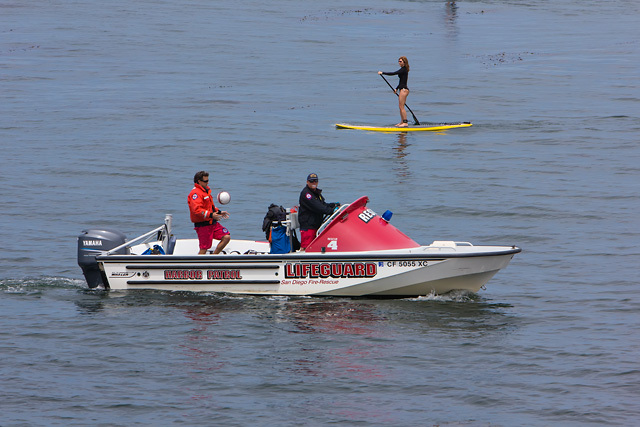 During our Easter walk at La Jolla Cove today I saw this lifeguard playing soccer in his boat, repeatedly bouncing the ball of his knee. I want to use this photo to talk about two concepts: telling a story, and catching the right moment. Powerful photos usually tell a story, perhaps with the exception of abstract pictures. Even though this was just a millisecond snapshot in time, it nonetheless tells the story of what happened for at least a few seconds. The sea was calm, the lifeguard was bored, and he was passing the time by bouncing a soccer ball. There are even secondary story lines, the boat captain looking over at me snapping pictures, and a woman on a stand-up paddle board going the other way, lining up with the lifeguard boat at this moment in time. So, while I give myself high mark for telling the story, I didn’t quite catch the moment I wanted to catch. I had intended to get a frame with the ball coming just off the lifeguard’s knee. However, even with a 6 frame-per-second burst I didn’t get it. I could have just kept snapping more frames, but once the paddle boarder has passed, which happened within just a few seconds, the picture became less interesting. So, while I didn’t get quite the perfect moment, it was still good enough to tell the story. This entry was posted in Picture of the Week and tagged canon eos 60d, outdoors, soccer, vacation, water. Bookmark the permalink. That’s a really nice shot–and I like how the ball is probably at the highest point in the air–it looked to me like that’s the photo you wanted to take!